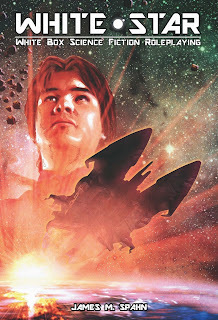 I just spent some time reviewing my PDF copy of White Star by James Spahn this morning. With today being Star Wars day (may the 4th be with you!) this was a clever time to release such a pulpy sci-fi RPG. White Star is based on the Swords & Wizardry Whitebox™ and truly is OSR (old school renaissance) in space. One important thing to consider before purchasing White Star is this is a rules light RPG. If you are looking for a system coated in heavy mechanics oil this game is not for you. Rather if your interests are more based on a foundation of table rulings and not rules then look no further. White Star is broken into twelve chapters at at 132 pages. The layout of the book is easy to follow and is what gamers should come to expect from a new product. The first thing I did was a spot check of the entire system to get a sense of what it was trying to accomplish. 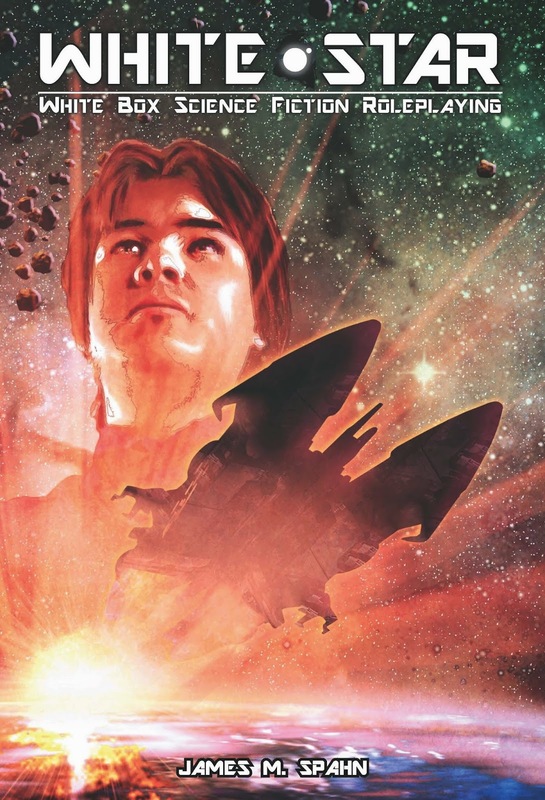 My hope for a space opera RPG I could twist and bend to my heart’s content was realized. Let me follow-up on my previous statement for the benefit of modern gamers not very familiar with the OSR. One of the hallmarks of old school gaming is rules are completely optional. You are encouraged to twist, bend, discard and mutate them if it means the game table is having fun. White Star comes complete with House Rule suggestions which are very helpful and will inspire you to design your own. In terms of character creation I was very happy with my cursory review of the races and classes as presented. The Star Knight class seems to accomplish the difficult task of creating a Jedi type character that does not dominate every session. That being said some of their powers (meditations) will require careful adjudication by a game master. Charm Person for example which is a staple of RPGs seems overpowered in some instances and potentially useless in others. One hour is a long time in my opinion to be under the caster's influence without additional saving throws. On the flip side I can see Robots being a popular race among Meta gaming players to avoid such meditations as Charm Person. My criticism of the former however always has that careful caveat that these rules are all optional. For example cybernetics are available in White Star and as presented really have little drawback. I immediately began thinking of ways house rules in my own games could be implemented to make them more balanced. Since robots cannot be healed by Cure Wounds I thought at what point does a player with cybernetics become more “machine then man”? Perhaps one of my favorite parts of White Star is the streamlined rules for starship combat. This is yet another example of simplicity shining through since it mostly follows the same rules as personal combat. I have always had a disdain for systems which have a game inside a game and this avoids that problem completely. For example both ships and characters have AC, HP, and Movement. This is easy to understand and keeps the focus on the action and not mechanics. I should mention AC in White Star is listed in both descending and ascending formats so fans of THACO and more modern systems should be pleased. Also included in White Star is a robust alien & creatures bestiary which should make most GMs happy. I think this is important since it gives us a flavorful foundation for our own DIY baddies. So far my favorite is the Living Asteroid and I can already envision a high speed chase through a belt full of them. Just imagine the PCs navigating past living asteroids as pursuing ships zig where they should have zagged and get chomped on! In the game master section of White Star there are several good suggestions for themes related to a campaign. Included is a good synopsis of running an interstellar civil war campaign. We get a hex map of the Kelran sector and some background on the planets which are part of it. Finally a 15 page example adventure for 6-8 characters of 1st to 3rd level is included. This is important since it provides an aspiring game master a jumping off point and inspiration for creating their own adventures. The Good: With the popularity of cinema like Guardians of the Galaxy and soon Star Wars: The Force Awakens White Star gives us that vibe at the game table. This is a great mash-up of your favorite space adventures in a completely moldable galactic OSR game. The Bad: As a rules light RPG some modern gamers may be turned off by the potentially ambiguous nature of the system. I personally find this to be one of the strengths of White Star but it may not be everyone’s cup of tea…or Procyon brandy. You will need to purchase White Star to find out what a Procyon is! For a discounted copy of White Star in PDF head over to Tenkar’s Tavern!